When the Circus Bolsillo lands in Larde, orphan Miles Wednesday and his angel-friend Little join its wondrous and chaotic show. They soon fall in with Doctor Tau-Tau, a mysterious and bumbling fortune-teller who once knew Miles’s parents and claims Miles’s father is very much alive. 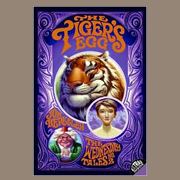 Miles sets out in secret with Doctor Tau-Tau, but to his surprise the search for his father quickly turns into a hunt for a much coveted and powerful Tiger’s Egg—a stone fabled to contain the soul of a tiger. No one knows its true whereabouts, and as Miles and Little begin to puzzle the bits together, they uncover its curious connection to Miles’s parents. Could the Egg be the key to the secrets of Miles’s own past? Jon Berkeley’s second novel in The Wednesday Tales continues the fantastical and often comical story of Miles Wednesday, as he sets forth on another strange adventure in pursuit of the truth.